Waramunchies Canteen provides a variety of interesting and nutritional food for our students. Our Canteen is open Wednesdays and Fridays at lunch time. Order from our Canteen menu which is also available on our Skoolbag App. Lunch orders are to be preordered either online or by the traditional brown paper bag. The preferred method of ordering lunches is by QKR! If you need help ordering please follow these step by step instructions. Limited purchases can also be made over the counter during the lunch period. Our canteen is only able to operate as successfully as it does with the valued support of our amazing helpers. If you would like to volunteer to be on the canteen roster – even just one day a term – we would really love your assistance. It’s a great way to meet new people. Please contact Trish or fill in the Canteen Volunteer form (link below). Our Canteen manager is Trish McDonald. 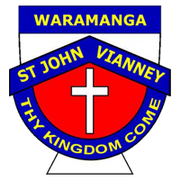 Trish can be contacted via the SJV Front Office on Wednesday and Friday mornings or email cds@homemail.com.au.